For many people, an allergy to pollen makes the spring, summer and/or autumn (fall) months a misery, confining them inside their homes with the windows and doors firmly shut. Although we think of brightly coloured garden plants as being the main pollen-producing culprits, many of the pollens produced by these flowers and flowering shrubs are too large for wind dispersal and do not, therefore, give rise to problems, unless you come very close to them. In fact, the major group of pollen sources associated with asthma, rhinitis, and conjunctivitis are tree, grass, and weed pollens. The pollination of trees depends on the ambient temperature and hours of sunlight, and since these factors are variable from year to year, so, too, is the amount of pollen produced. Typically, however the pollen season for each tree species lasts about three or four weeks. Just when you think you are safe and can finally open your windows once again, having survived both the tree-and grass-pollen seasons, next it is the turn of the numerous weed species to add their pollen load to the air you breathe in. Ragweed (Ambrosia) is a prolific pollen producer and its pollen season in the northern hemisphere runs from August to November (or until the first frost, whichever is sooner), and levels peak in mid September in many areas. Each plant produces about a billion pollen grains in a season and these have been detected 600 km/370 miles out at sea. Studies have shown that ragweed pollen is a very powerful allergen, with fewer grains needed to produce a hay fever attack than with other allergens. Another significant plant is the wall pellitory which also produces large amounts of a highly potent pollen. There are worldwide reports of severe asthma attacks occurring in association with thunderstorms during the hay-fever season. 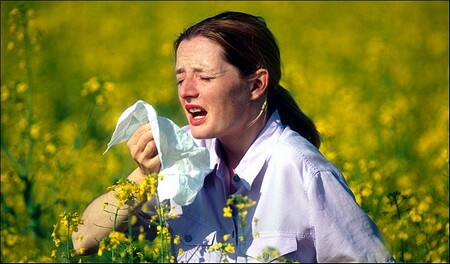 These attacks happen in individuals who suffer from hay fever but who do not usually experience asthma. It has been shown that grass pollens rupture in the high humidity preceding a storm, releasing large numbers of starch granules containing allergen. While pollen grains themselves are too large to be inhaled into the airways, these starch particles, either alone or bound to airborne particulates (such as diesel exhaust carbon particles), can readily be inhaled into the airways and induce an allergic reaction leading to asthma. On occasions when “thunderstorm asthma” has occurred, pollen counts have been high and the high humidity has led to a great increase in starch granules containing allergen within the air Sufferers need to be aware and stay inside if the weather forecast is bad.